Ladies and gentleman, I present to you, Community Patch #2 - Bear Foot Unchained, HD Trucks and Cowpod 1.0.1! This patch is provided as is. TRI and Microsoft have nothing to do with it and will offer no support. If it doesn't work please post in here but my knowledge of troubleshooting problems is limited. And please BACK UP YOUR ORIGINAL FILES!!!! I can't stress this enough. A big thank you to Cale for creating an alternate HD pack. These trucks are made in the spirit of the original stock trucks but with a better body design and a much better texture work. Both the original stock trucks and the HD versions can be selected and they are clearly labeled as the HD trucks can create some lag under certain circumstances. Bear Foot has finally been set free. From now on, in multiplayer games, the default truck that gets selected when you don't have the opponent's truck is Boogey Van!!! And in further good news. Cowpod has been updated and it is compatible with Community Patch #2. At least in terms of supporting the correct number of pods. It cannot be used for fixing MTM2's registry but it's on the ToDo list. Unpack the files from within this archive (rar or zip) to your main MTM2 folder overwriting the original files. Please BACK-UP the original files in case something goes wrong. -- 1360x768 - new bug. Will look into it. -- 1366x768 - new bug. Will look into it. -- 1440x900 - patchy on Windows 10. You might be lucky and it works. -- 1536x864 - Directx5-7 doesn't support it. Will consider removing the option. - Zoon Kitchen 2 animations are still wonky when using an increased draw distnce. Have not been able to crash the game but it hasn't been extensively tested. - The menu bar won't go away in Windows 8 and Windows 10 when racing. Please use nGlide or dgVoodoo to get around the problem. - Using snow and increased visual distance lags the game. Please either avoid snow or decrease visual distance. This is a game engine issue and until it's ported to DirectX9 it won't be fixed. - The 3dfx compatible resolutions (for those using nGlide or dgVoodoo2) are clearly labeled with 3dFX. Do NOT attempt to try a different resolution, the game will crash. If you want to use 3dFX wide screen please select 856x480 and in nGlide 1.05 (mandatory 1.05) use the "fit to screen" option. - If using Windows 8/8.1 you will most likely have to use nGlide/dgVoodoo as the new resolutions have terrible performance on this OS. This is strictly a DirectX5/7 and Win8 incompatibility and there is nothing that can be done to fix this. 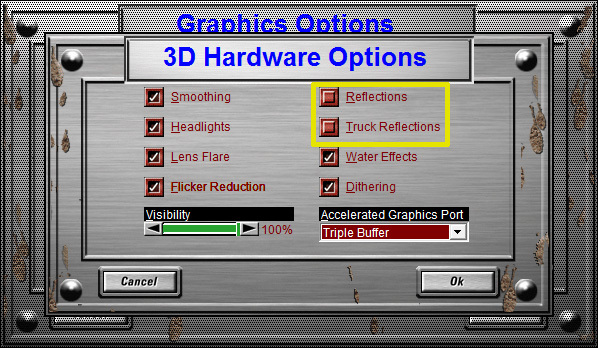 - To ensure maximum compatibility with any of the tracks, custom or stock, please go to Options>Graphics>Hardware Options and turn off the following options: Reflections and Truck Reflections. - Cale’s HD trucks have been added to the game as an alternative to the original stock trucks. Both versions can be used. Just careful as the HD trucks can create lag on certain tracks and with the increased draw distance. - Truck appearing black in Driver’s Circle when you first start the game has been fixed. - The extra green line in the joystick/wheel calibration page has been removed. - Multiplayer latency has been fixed. It now displays correctly. - Increased maximum pod count to 200. (likewise, maximum track count is now 200 and maximum truck count is now 200). - Bonus fix: Cowpod has been made compatible with comm patch 2. - The patch should now work with any windows xp version and possibly erlier versions. - IMPORTANT FOR ONLINE PLAY: Boogey Van has been made the default truck. Bearfoot no longer gets selected as the default truck when you don’t have a custom truck podded. Please note this down. From now on Bearfoot can be freely used for online play (and Boogey Van has become the truck-non-grata). - The program files (86) issue for online play might have been fixed but I have not verified. Still, I don’t recommend people to go out of their way to test this. - Game now correctly alerts users in multiplayer that people are using a different game version. Gameplay is still possible and shouldn’t pose an issues (just like MTM2 patched and non-patched were able to work with each other). - fixed trucks unable to drive over ground when terrain height set to 0 (rumbles like Sand Castle for example). - Instant Replay page finally 100% fixed. - Increased draw distance to 120 tiles! To put this into perspective, the original game had a max of 20. The CommPatch1 has a max of 50. This has a max of 120!!! Considering this setting is a radius (120 starting from the truck) it means that the diagram is 240. The game map is 256, so it basically loads about 95% of the map at any given time! - The visual distance setting in the graphic option now displays exactly the number of tiles you want to set it at instead of percentage. - Increased vertices and vertex limits to go with the increase in visual distance (certain tracks crashed because of it). - Fixed the checkpoint finder! It now works correctly on all resolutions! - Fixed the instant replay page. I have no idea at which point I screwed this up or how but there was a problem in the way the .POD was built. - version number changed to 2.0.44 (multiplayer is compatible with people using the original version, 2.0.42). - Increased maximum verts limit (less crashes). 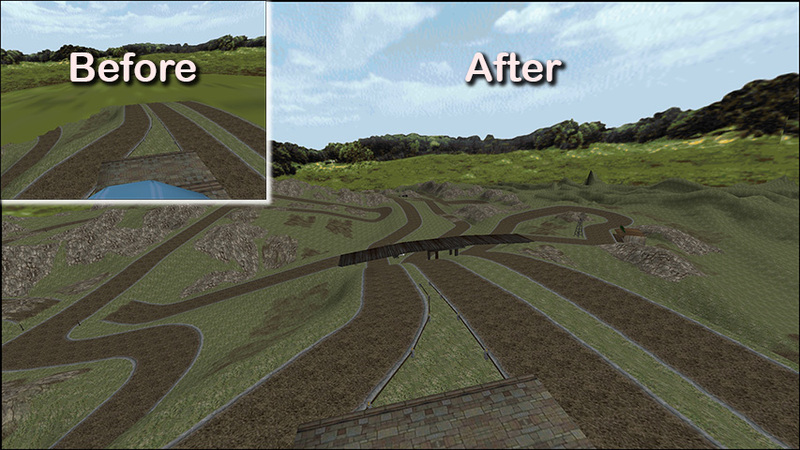 - Maximum number of objects limit increased (stops tracks from crashing with the new visual distance). - Added new UI to go with the new resolutions. - Video clips are working again (for those of you who it didn't work for anymore). - All 4 truck tires leave track marks. - Tire track life span increased. - Added a BLIMP button in graphics option. Now you have full control of whether you want the blimp to appear or not (can help stop certain tracks from crashing). - Lowered the position of the lap time info so as to not be covered by the bloody menu. (Win 8 and Win 10 issue). - Compiled against DirectX7 headers (at least I think so, can't find a reliable way to test this out. MSI afterburner only says DirectDraw but does not give the version number. - Increased some vertices limits. - Disabled a keyframe AV. This keyframe error has a connection with ZooN Kitchen 2. - "too many vertices" error should have been fixed. I have doubled the vertices limit. Am curious if it's going to be hit. - Pitch black hall-of-mirror bug has been fixed. - Removed obsolete resolutions (320x200). Now the game defaults to 640x480 as the lowest. Also removed 2560x1440 as it doesn't work with Directx5. - Improved the fail safe mechanism in case a wrong resolution is chosen. The game should default to 640x480. - The checkpoint finder has been improved... somewhat. It's not a garbled mess anymore. It's not great but it's functional at least. - Multiplayer should be fixed now. - Monster.exe should work in Windows XP now as well. - Bumped up maximum render distance from 20 to 50 units. 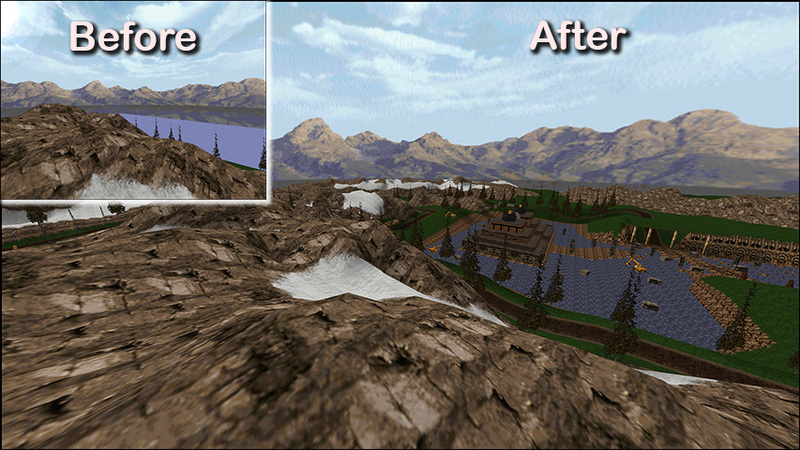 - The maximum render distance is now fully customizable from within the game. - Max Verts increased from 800 to 1200 (same as render patch). 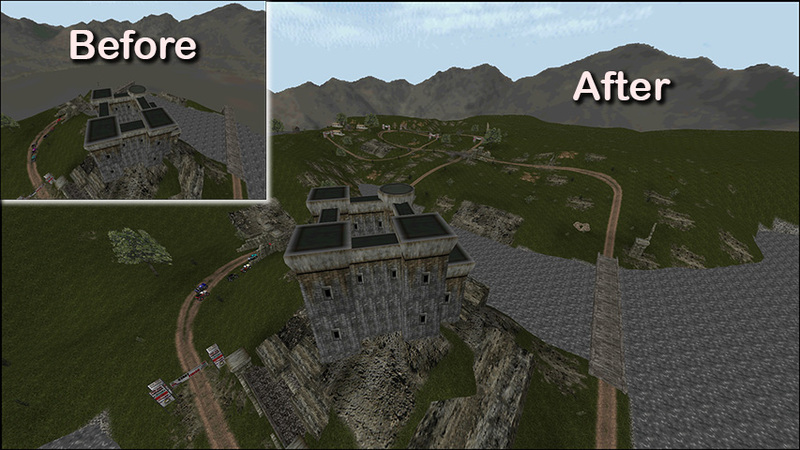 - Maximum number of objects increased from 256 to 512 (same as render patch #2. this initially caused crashes on tracks like duality and razzle dazzle). - Mark finally increased the box count - or otherwise known the infamous ground box error. Limit increased from 600 to 800. Tracks like Razzle Dazzle can now be completed with 8 running trucks. - 3dfx 16:9 has been added. - Increase in the object limitations (models, textures etc). - A fix to remove the menu bar during gameplay in Win8/10. - Maybe further bump up the pod limit. - Workaround fix for snow issue (most likely removal of snow texture but increased number of snow flakes falling). These will take forever to do as it requires a more advanced coding knowledge but ultimately I want it done. - Port the game to DirectX9 to fix many of the compatibility issues/crashes and allow even higher resolutions (2560x1440 etc. - Re-introduce Drag system from MTM1. - Make it read more than the first 8 letters of a sit file name to be the tracks ID. - Accept Axis Z for controllers. (this one will be looked at only after game is finally ported to DX9). - Incorporating an ingame FPS limiter (not quite Vsync but rather a manual box where you can the maximum limit to whatever you want). 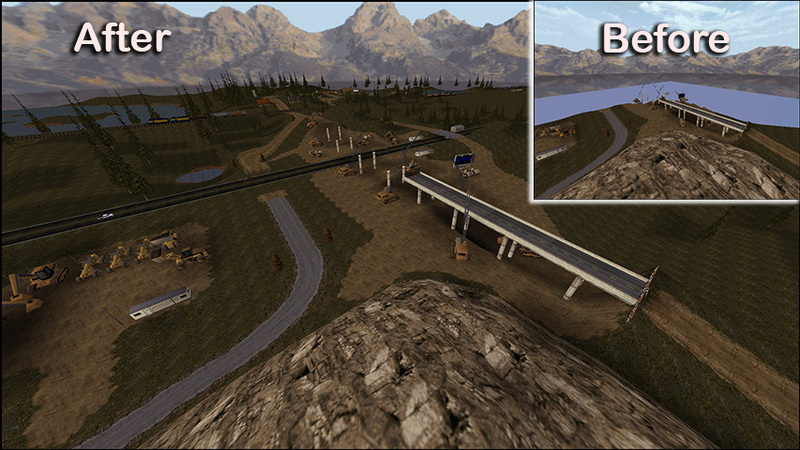 - Thanks to Cale for supplying the bulk of the pictures used in the patch and for creating the HD truck pack. - Thanks to Gamer121 for supplying HD artwork used in the patch. - The fine folks at TRI that made a game that has stood the test of time for so long and turns out to be very modable. - Certain tracks like ZooN's Kitchen 2 or Toys in the Attic are very predisposed to crashes. Either decrease the visual distance and/or deselect the blimp in Graphic Options. - The patch has been tested and works 90% of the time flawlessly on all tracks with 8 stock trucks racing. - Highly detailed custom trucks may give performance issues on certain object heavy tracks like Alpine's Certifiably Crazy. There is no work-around for this. It is a game engine limitation. 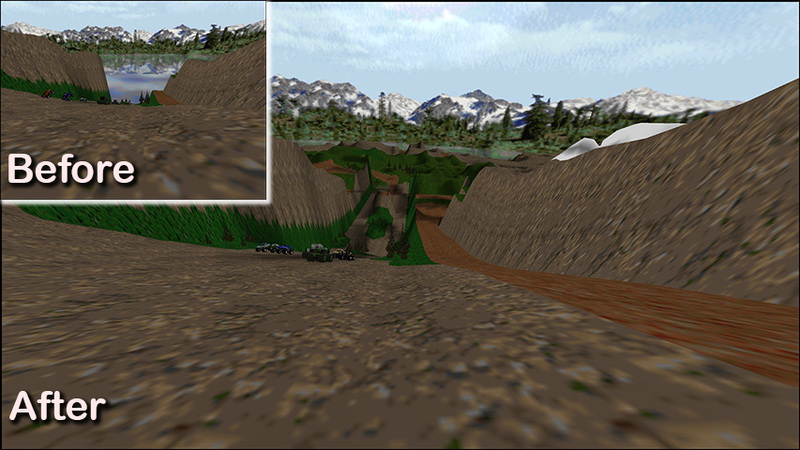 The only solution is to either not use a highly detailed custom truck or to revert back to a regular draw distance. However most of the tracks out there will not have a problem handling 2 or 3 highly detailed custom trucks.